Kuze and the Major come up with a plan to save the refugees, but the chances of its success are slim. 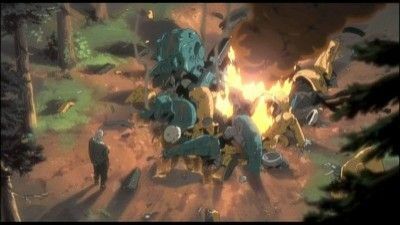 Realizing this, the Tachikomas disobey the Major's orders and come up with a plan of their own. 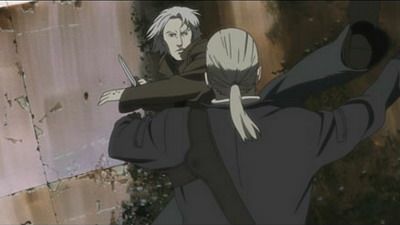 Batou has also disobeyed the Major's orders to go to the bridge and is desperately searching for her in the ruins of Dejima. Meanwhile, the Prime Minister is frustrated with being spurned by the Chief Cabinet Secretary. Determined to be remembered as more than a mere figurehead, she takes matters into her own hands. As the JMSDF's Special Forces Unit rounds up the remaining members of Section 9, Daisuke Aramaki meets with the Minister of Justice to make one last appeal to the government to salvage his team. Section 9 may be down, but certainly not out. 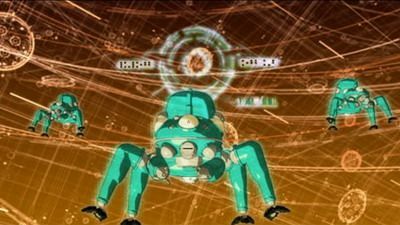 They have help in the form of their "think-tanks", otherwise known as the Tachikomas. Public Security will make one final push to save itself from extinction. As the attack on Dejima escalates, the Major catches up with Kuze. She explains the whole situation to him and he agrees to follow her. They are about to leave when both are attacked by the Self-Defense forces and in the confusion are trapped under the rubble. Togusa rescues the Prime Minister and brings her back to her office. 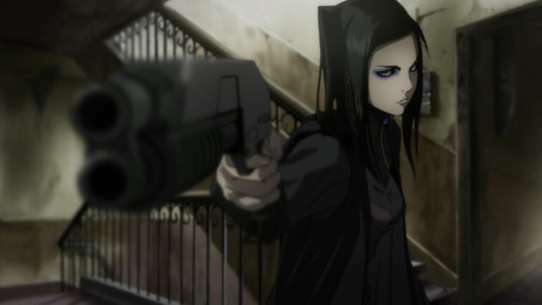 There, Aramaki hopes her influence will stop the launching of the ultimate weapon. Meanwhile, Batou reasons with Section 4. 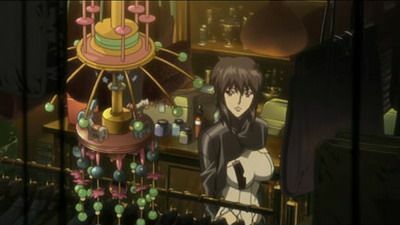 While on an assignment guarding the Prime Minister, Saitou and the Tachikomas pass the time playing poker with a few policemen who are also assigned to the case. Much to the chagrin of the other men, Saitou wins hand after hand. The Tachikomas take notice of Saitou's uncanny accuracy and start to comment. 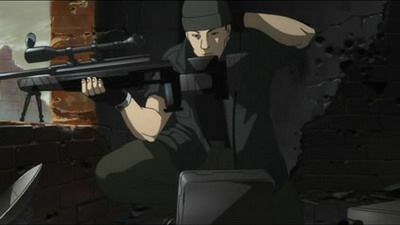 Their constant chattering quickly gets on the other player's nerves, so to smooth things over Saitou recounts his time working as a sniper for mercenaries in Mexico. Following the events of the "RE-VIEW", Togusa has been rushed to the hospital. Just before he goes into surgery, he passes what he has learned to the rest of his team. As he fights for his life, his colleagues at Section 9 take over the case to find the vaccine recipient ledger and the person responsible for taking it. However, others in the government are not happy about this investigation. 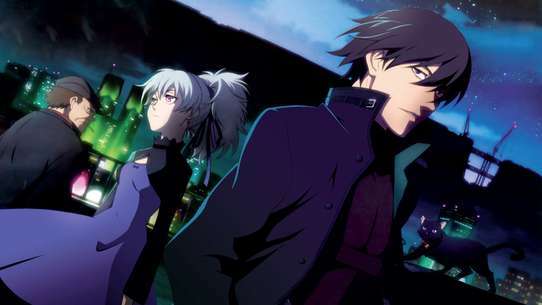 The Drug and Narcotic Suppression Squad, the same unit that had shot Togusa in the previous episode, is again dispatched by the Ministry of Health, Labour, and Welfare in order to find the thief and the ledger before Section 9 does. With the felling of Dejima Bridge by the refugees, a rumor circulates around the Cabinet that the refugees plan a mass suicide bombing using nuclear bombs. Fearing this, the Cabinet steps up the attack against the city. Meanwhile, Prime Minister Kayabuki has been secretly arrested and taken to an unknown location. 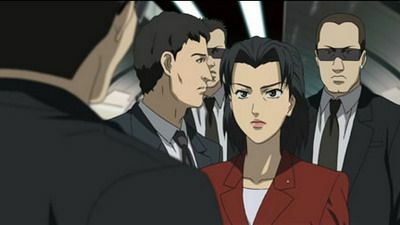 Aramaki, Togusa and Proto, in trying to help the P.M. are also taken into custody and secured in her office. 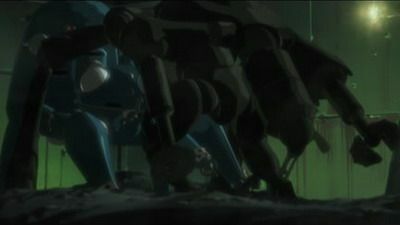 With Section 9 having entered the non-communication zone and Aramaki being cut off from communication, Ishikawa and a Tachikoma make their way to Spring-8 on their own. Meanwhile, Gouda has sent an unwitting Section 4 after Section 9 to retrieve the plutonium. 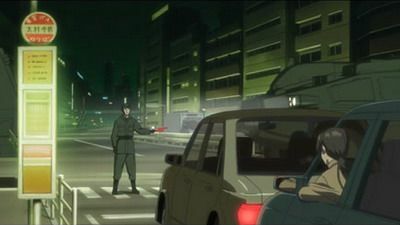 Togusa has been released from jail, but his badge and gun are confiscated and he is given papers showing the dissolution of Section 9. Out of work and depressed, he tries to find information on the others, but turns up nothing. 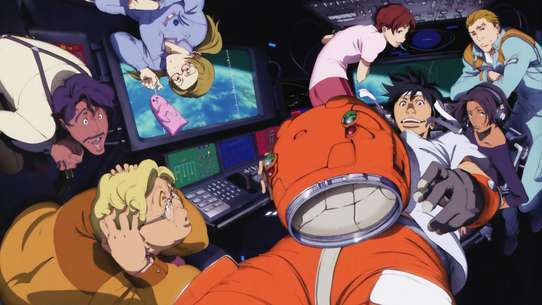 Trying to turn his life around, he begins to look for a new job, only to be sidetracked by the ongoing case against Secretary-General Yakushima involving the illegal use of micromachines. With the news plastered everywhere, Togusa cannot help but wonder where he stands now. The Laughing Man returns and, just as he did six years ago, kidnaps the President of Serano Genomics without being detected. Section 9 arrives too late and sets out to find him. Meanwhile, the Laughing Man and Mr. Serano discuss what happened six years ago. The stakes are much higher this time, and for the Laughing Man failure is not an option. The Chief Cabinet Secretary uses the excuse of the refugees possessing 10kg of plutonium to mobilize the military against Dejima. With the available evidence against the refugees, Prime Minister Kayabuki reluctantly agrees. However, she soon learns from the Chief Cabinet Secretary that he's aligned himself with Imperial America and is now after her job. Knowing her days as P.M. are numbered, she agrees with Aramaki's plan and calls the U.N. in for a nuclear inspection of Dejima. 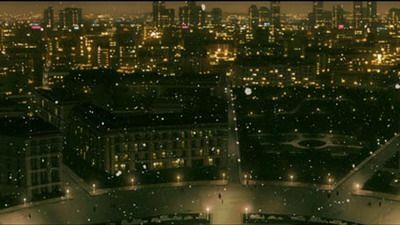 The move buys them some time to defuse the situation, and Section 9 heads to Dejima to meet up with the U.N in two days. However, with tensions running high it is only a matter of time before someone fires the first shot. 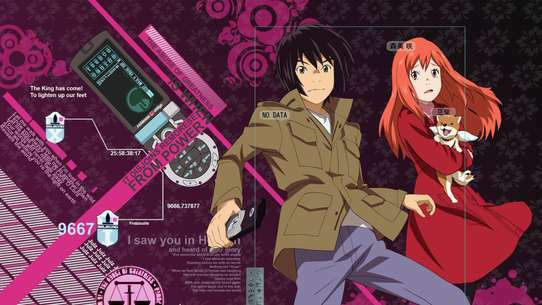 Events begin to shift into overdrive after the events of "ERASER". While things seem to be going Section 9's way, people in the shadows are starting to appear. 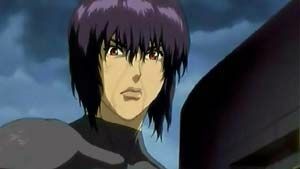 As Motoko, accompanied by her friend Kurutan, arrives at the hospital to switch to a new prosthetic body, Togusa begins the recovery process after being wounded by the DEA's NARC Squad. However, the people still active within the NARC Squad have a few more surprises in store. A high-level hacking has occured at the Ministry of Health, Labour and Welfare. Section 9 has traced the source of the hack job back to a vocational aid center located high in the mountains. The hack was done by someone very skilled since it only took two hours to crack the MHLW's ultra-secure barriers. The odd thing is that the MHLW has not filed a formal complaint about the incident. 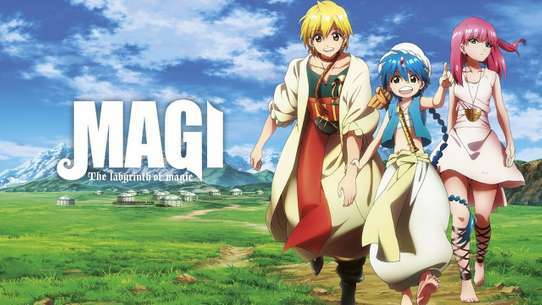 Togusa is sent undercover to discover what is going on at the aid center. 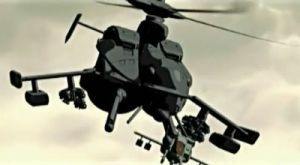 Section 9 heads to Etorofu in search of Kuze. 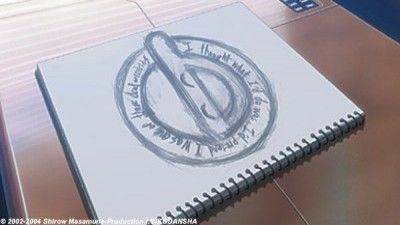 During their investigations, the Major finds an interesting floppy disk on the body of a dead addict. 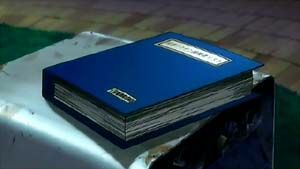 The floppy proves to be a goldmine of information, as it contains records of plutonium transactions. The last buyer to purchase the material was a group of Asian refugees. Realizing the transaction is about to take place, the team rushes to the location and is surprised by what they find. Back on the Laughing Man case, Section 9 tries to find evidence of tampering in the Nanao=A case and delves more into the recent hack job at the Ministry of Health, Labour and Welfare ("PORTRAITZ"). 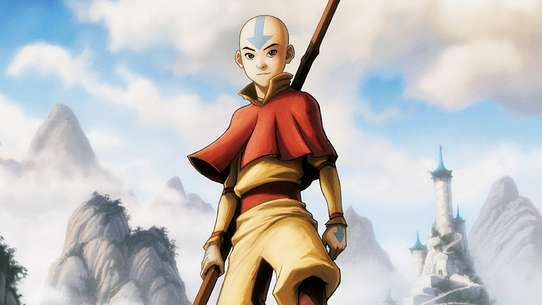 Using J.D. Salinger's The Catcher in the Rye as a guide, Togusa checks out the MHLW and finds that something is missing: a ledger containing a list of vaccine recipients. 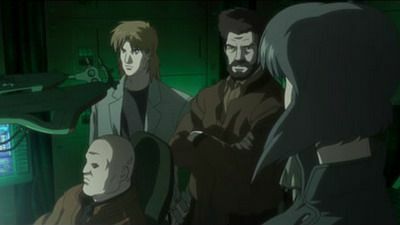 Much to the chagrin of Batou, Motoko, and the rest of the team, Kuze and the refugees manage to escape in one of the camouflaged boats. They are further hampered when an explosion causes heavy losses, leaving them unable to follow the fleeing boat. 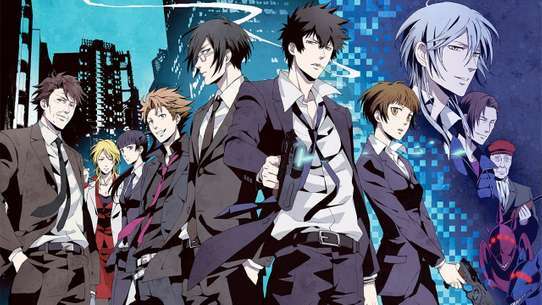 Regrouping, the team decides to refocus the investigation to the events surrounding Kuze. They start a secret investigation into Sagawa Electronics, the company responsible for the nuclear material transaction, and find that Gouda was involved. Meanwhile, as the boat heads for Dejima, Kuze makes his own unsettling discovery. 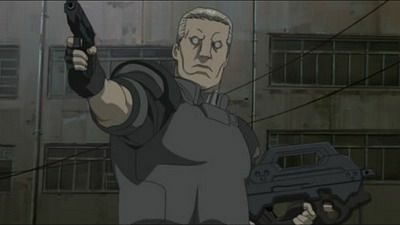 The Major and Batou are flown to Berlin in an effort to track down a terrorist called "Angel's Feathers". 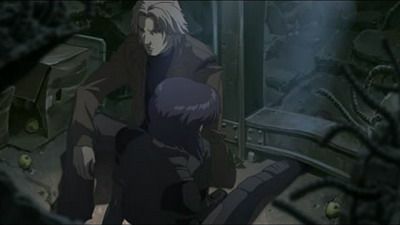 While there, Batou attracts the attention of a young girl in a wheelchair. 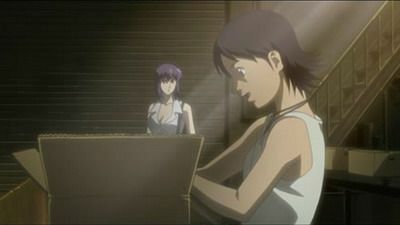 The girl is waiting for the yearly visit from her father, but Batou's appearance piqued her curiosity. As the days lead up to her father's visit, her curiosity in this stranger grows stronger. 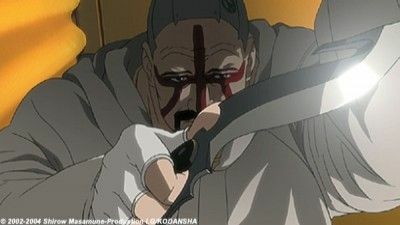 Togusa, at the request of Chief Aramaki, returns to work. Both head out to the Prime Minister's residence with a detailed report citing Secretary-General Yakushima as the real power behind the Laughing Man Incident. However, before they can even leave their own building, they are told by the Minister of Home Affairs that Public Security has already been accused of being the masterminds behind the Laughing Man. The situation has gone from bad to worse and it will take a concerted effort by all of its members for Section 9 to clear itself of the charges. Following a tip, the Major conducts an undercover investigation of Kuze in Taiwan. While there, she saves a boy running from the Mafia. After being saved, the boy follows her, making sure that she finishes what she started. The mafia will continue to pursue the boy and the Major has to protect him. Armed terrorists have taken over the Chinese Embassy in New Port City. Holding an unknown number of hostages, the group, calling themselves the Individual Eleven, are demanding that the government cease accepting Asian refugees and dissolve the five Asian refugee camps situated throughout Japan. The members of Section 9 have mobilized and are in position to move in. However, due to the events of the Laughing Man Incident (1st GIG), Section 9 technically no longer exists. 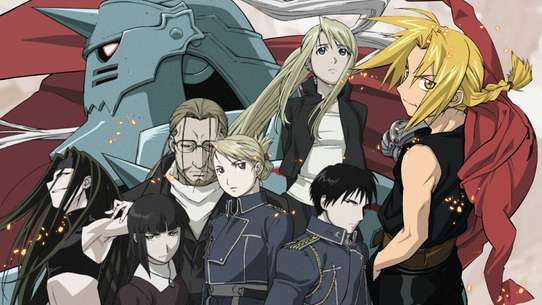 The unit must wait for an official order from Chief Aramaki, who is busy making his case in front of the new Prime Minister of Japan. At a press conference, the Superintendent-General makes himself a prime target for the Laughing Man's threat. 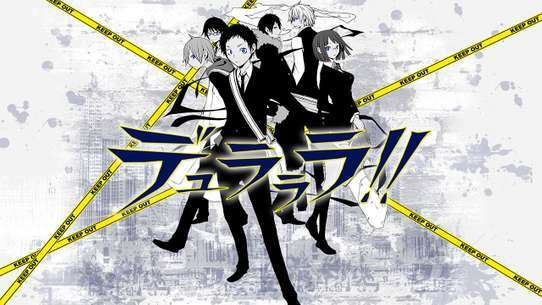 Section 9 has gathered enough evidence to arrest Nanao=A, but before they can, he is able to release a modular, delayed-action virus. 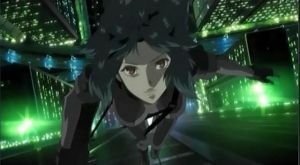 The virus seems to only affect those on the security detail that is guarding Superintendent-General Daidō. However, Section 9 will not know who on the security team has been taken over by the virus until the symptoms begin to manifest. By that time, it may be too late. A cat thief named Cash Eye has infiltrated a building owned by Federation of Economic Organizations Chairman Tsutomu Tadokoro. The cat burglar made quick work of the top-notch security system and left a calling card on the Chairman's desk saying that Cash Eye will be infiltrating his vault during an upcoming party. Albeit reluctant to get Section 9 involved, Aramaki has no choice but to assist Tadokoro. Prime Minister Kayabuki has requested that his unit go undercover in order to prevent the burglary. Marco Amoretti, a former Navy Petty Officer from the American Empire, has come to Japan and is committing heinous acts of brutality against women. Section 9 is assisted in this matter by the American Empire's CIA. 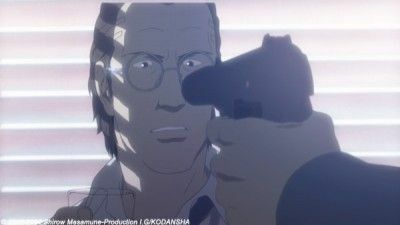 While this doesn't sit well with Public Security's members, Batou finds the whole case particularly hard on his psyche as the nightmares from his past rear their ugly head.